As soon as the ball drops and you kiss your loved one and take a swig of champagne, your can flip to a very new and exciting channel. At midnight night on January 1, 2011 (that’s today!) Oprah Winfrey’s OWN (That’s short for Oprah Winfrey Network) will be launched and available in 85 million homes! The first 12 or so hours will be full of teases but starting at noon it will be full of Oprah’s Guide to OWN. 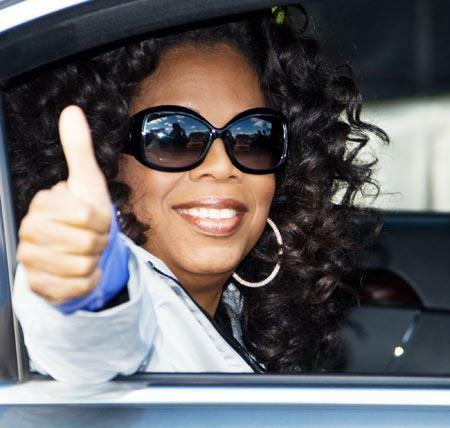 The first show to premiere on own will be hosted by Oprah, herself, and welcome her viewers to the network. “I’m aiming for a moment where somebody could say, ‘I never thought of it that way before.’ I just love that,” Winfrey explained to Parade magazine readers in an recent interview. The launch comes after more than two and a half years of hard work and planning, and approximately $110 million spent alone in start up expenses. This launch marks the first time a talk show host has monopolized an entire channel, let alone run by a single personality. But lets face it, Oprah is larger than life. We can’t part with her just yet. Unfortunately, we can’t tell you what channel OWN will be premiering on. Oprah isn’t a simple woman and we respect her for that. You can find the digits by visiting OWN’s website and using the “channel finder” for you American fans to find OWN in the hundreds of digit channels. What can you expect to watch on OWN? A lot so far. There are star-studded shows lead by Jay Z, Diane Sawyer, Goldie Hawn, Rose O’Donnell, Julia Roberts, Gayle King, The Duchess Sarah Ferguson and many, many others. Another show entitled “Your OWN Show: Oprah’s Search for the Next TV Star,” will premiere of the network. The brand new show features ten contestants competing to win their OWN a show. The OWN launch is not without a mixture of anxiety and glee. Great beginnings come with tearful endings– The “Oprah Winfrey Show” has aired worldwide over the past 25 years and will end in May, 2011. Well, what do you think of OWN so far? Are you ready for an entire network of spiritual, positive, self-help shows? WE ARE! Happy New Year once again, everyone! !